Amazing Banana Cream Pie made with a homemade rich, velvety custard, lots of fresh sliced bananas, a crunchy cookie crust, topped off with a mountain of fluffy whipped cream! 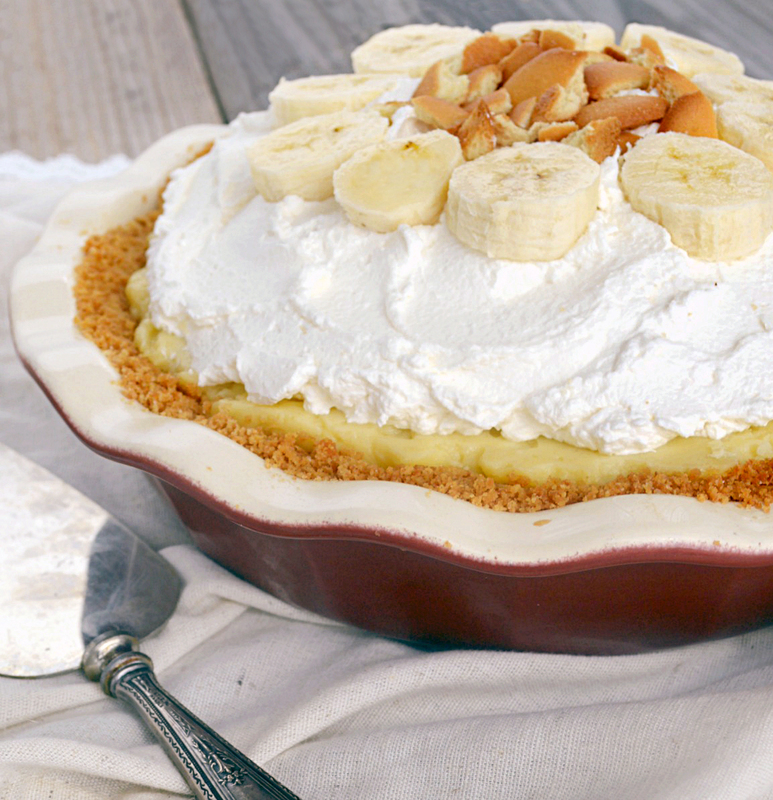 Banana Cream Pie is one of my all-time favorite desserts. Let me tell you though, I’m not alone in loving it. My whole family adores this pie. And really, is there anyone on the planet who doesn’t? This diner classic is old-fashioned, pure All-American goodness! A thick, buttery, cookie crust layered with rich, decadent vanilla custard and lots of fresh bananas all topped with a mountain of fresh homemade whipped cream. This is one of those fabulous desserts that will have forks flying and elbows being thrown just to get a slice! Maybe you should think of making two! So, for years I made Emeril’s Banana Cream Pie. It was my go-to recipe. Loved it. It, however, didn’t cut neatly into pieces and was messy. The crust cut through easily enough, but the filling was just a tad too loose. It didn’t make a pretty presentation. I ultimately switched out the original rolled pastry crust because I like my banana cream pie with a yummy crumb crust a lot more. And frankly, I love how easy the crumb crust is to prepare! No rolling and no floured counter mess! Let me see, I like the taste better, hecka easier to make, and much less to clean up. That’s a total no-brainer for me! 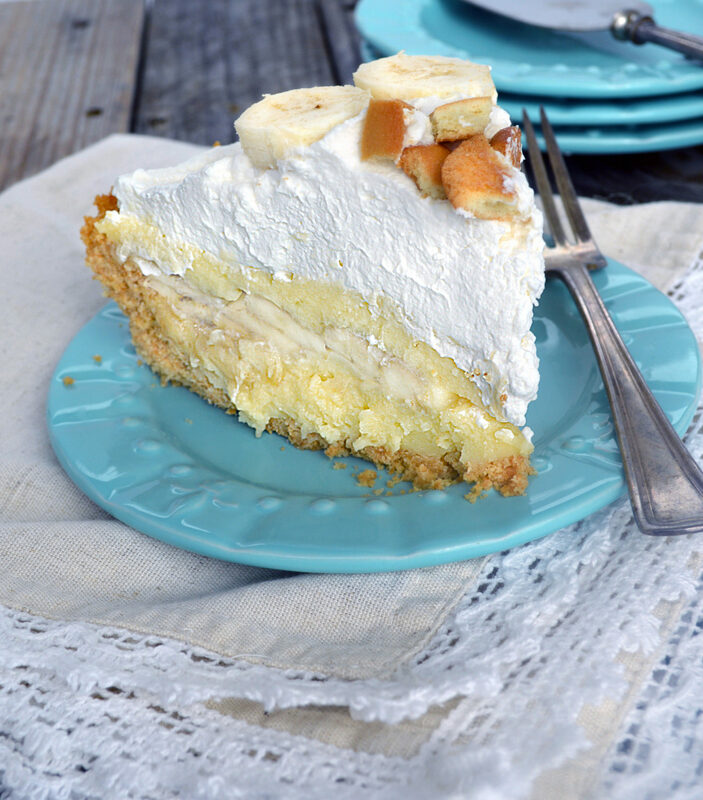 I love a Nilla Wafer crumb crust with my banana cream pie, so of course, that’s what I’m sharing with you in this recipe. In my book, they’re the perfect filling and crust combination. But what is life without choices…….Here are just a few for this pie. This pie is also absolutely delicious with either a rolled pastry crust or a graham cracker crumb crust as well. Another alternative for the crust, that I occasionally make, is a crumb crust made with half Nilla wafers and half graham crackers. I follow the recipe I’ve given you below and but instead of using all Nilla wafers, I use 1 1/4 cup crushed graham crackers with 1 1/4 cup crushed Nilla wafers. Use whichever crust floats your boat. One thing that may go without saying for most people, but I, of course, had to find out the hard way, is all Nilla Wafers are not created equal. My favorite are the ones made by Nabisco (I’m not being paid or compensated to say this). It may now seem like a big deal, but every generic Nilla Wafer cookie I’ve tried are over sweet and have very little vanilla flavoring to them. They’re just blah and don’t bring enough flavor to be used in the crust of this glorious pie. If you’ve happen to find a good generic brand, I’d love to hear about it. Please share it with us in the comment section. If you’re short on time, or just want a quicker version of this recipe, you can simplify things by using a store bought graham cracker crust or a boxed pastry crust. Cooking the Custard: the custard needs to be cooked to almost a boil reaching a temperature of almost 212 degrees. The egg yolks have a starch-digesting enzyme called alpha-amylase. In order for a successful gelling of a starch in the recipe, it has to be cooked at that temperature. If it’s not, the left-over enzymes in the eggs digests all of the nice firm starch gel and your custard is nothing but liquid. After the custard has been prepared on the stove top, it needs to cool down a bit. So, the first thing you do is pour the filling into a shallow bowl. Cook’s Illustrated suggests using a second pie plate instead of a bowl. I love this idea. It’s obviously the perfect size. It’s shallow depth and fairly wide diameter help the filling cool more rapidly than a smaller standard mixing bowl would allow. It’s really important that you cover the surface of the filling directly so a skin doesn’t form. It may seem strange to lie the plastic wrap on top of the hot filling, but that’s the best way to do it. If a skin forms, you’ll either have to strain the filling or endure lumps in your finished pie. Yuck! The layers of custard and banana are assembled after the filling has cooled down but is still warm. This technique is slightly different from most banana cream pie recipes so, I just want to point it out, so you don’t inadvertently overlook it. Don’t assemble the custard and bananas while the custard is still hot or the pie can have a heavier, denser overall texture. This recipe is best made with firm, just ripe bananas. They hold up in the pie better than very ripe bananas and they keep their nice bright creamy color longer. Many recipes suggest refrigerating the pie overnight after the layers of custard and banana have been assembled in the crust. I like the idea of the custard setting up in the fridge overnight, but I don’t like how the bananas look after doing so. There’s just no way I know of to keep them looking fresh and just sliced. Some recipes suggest brushing the sliced bananas with citrus juice. I think that’s a great idea for some recipes, but personally, I don’t like the taste it adds to this custard. Another suggestion is to make sure the sliced bananas are completely covered with the second layer of custard. This eliminates air coming into direct contact with the bananas. If you go this route, I suggest you also gently press on the top of the second layer of custard with a spatula to make sure the custard gets down into all the little crevices between the pieces of banana. Another trick to help fill any of those small voids and settle the filling into them is to place a dish towel on your countertop and gently tap the pie plate down a few times on the towel. All that said, I strongly prefer to serve the pie the same day it’s assembled. I like a nice thick layer of whipped cream on this pie, so I start with 2 cups of heavy cream. To make the best whipped cream I can, I like to put my metal mixing bowl and the beaters from my mixer in the freezer 10-15 minutes before I make the whipped cream. I keep the heavy cream in the fridge until I’m ready to pour it in the mixing bowl. You can use regular granulated sugar or powdered sugar to sweeten the whipped cream. I prefer using powdered sugar because it dissolves easily into the cream. If you use granulated sugar, add it to the cream before you begin to beat it so it dissolves completely. Banana Cream Pie made with a homemade rich, velvety custard, lots of fresh sliced bananas, a crunchy Nilla wafer cookie crust, topped off with a mountain of fluffy whipped cream! In a medium mixing bowl, combine the vanilla wafer crumbs and sugar. Add the butter and mix well. Press firmly onto the bottom and up the sides of a 9 inch pie plate. Bake 10 to 12 minutes or until golden brown. Remove from oven, and cool completely before adding filling (about 1 hour). In a medium, heavy-bottomed saucepan, combine sugar, cornstarch, and salt. Whisk in egg yolks, Gradually add milk and cream. Cook over medium heat, bringing to a gentle boil, whisking constantly until mixture thickens 8-10 minutes. Continue to gently simmer for 1 minute, lowering heat as necessary, and stirring constantly. Remove from heat. Whisk in vanilla, butter, and brandy. Pour filling into a bowl. Place plastic wrap directly on the surface of the filling to prevent a skin from forming. Cool for about 30 minutes or until filling is warm, but no longer hot. Pour half of the warm filling into the cooled crust. Peel and slice the bananas into 1/2 inch slices and layer on top of the filling. Pour the remainder of the filling over sliced bananas. Place a clean sheet of plastic wrap directly on the top surface of the filling. Refrigerate pie until completely chilled, at least 3 hours. Whip the heavy cream in a chilled bowl until soft peaks form. Add powdered sugar and vanilla; continue to whip until peaks are just stiff. Spread whipped cream over topping and shape decoratively into a mound. Refrigerate until ready to serve. Check Out These Pie Recipes! Peanut Butter Pie – A luscious, creamy peanut butter filling nestled on top of a rich, unique peanut butter ganache, it’s peanut butter heaven! Pumpkin Pie Lasagna -Rich, creamy, no-bake dessert will become the next staple for any season! Strawberry Pie -Easy fresh Strawberry Pie loaded with thick, delicious, Jello glaze intensifying the yummy strawberry flavor! Decadent Chocolate Rum Pie -Rich Chocolate dessert enhanced with a splash or rum, layered on top of a chocolate crumb crust! Peaches and Cream Pie – Delicious with fresh layer of peaches topped with streusel crumb! 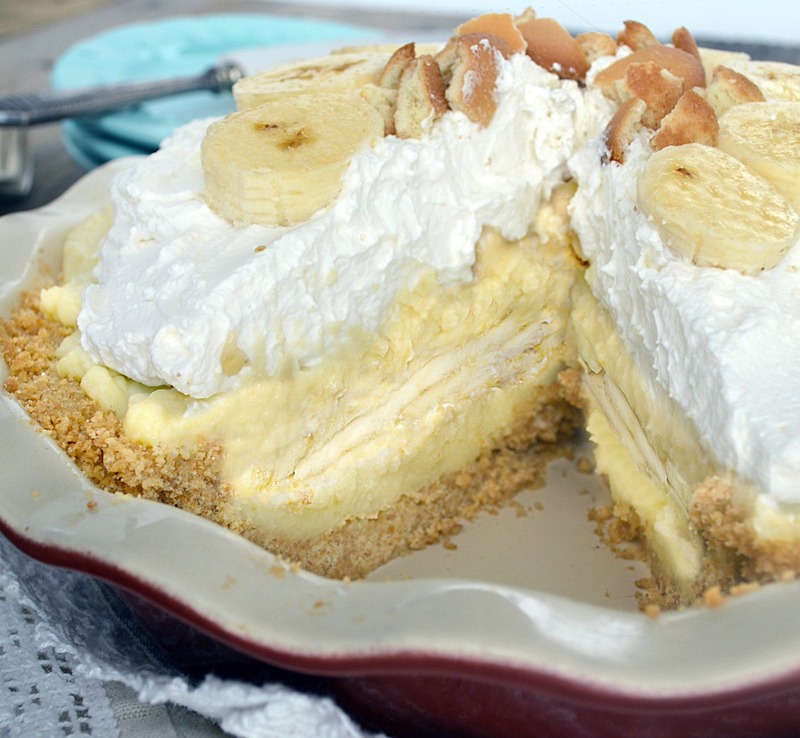 Million Dollar Pie – This creamy, no bake, Million Dollar Pie is the easiest pie ever to make. Its luscious tropical filling is utterly delicious. An ideal dessert for summer! Atlantic Beach Pie– is full of delicious contrasts. Sweet and salty, tangy and creamy, fluffy and dense! Finish your fun in the sun today with this paradoxical coastal invention. Banana Cake with Cream Cheese Frosting – features lemony banana flavor and a frosting that couldn’t get any more moist! Can thecustard filling be made 2 days in advance and assembled day of and still be okay? Looking forward to making this for my husband’s birthday tomorrow. His Nan always made him banana cream pie and I am hoping to match it! (FYI Typo: Make the Filling #1: “…Cook over medium heat, bringing to a gentle bowl *boil, whisking constantly” Can’t wait to try it!! Hope my custard comes out perfect! So it does not look like you are tempering the eggs as in every other recipe. Is that correct? Hi Karen. I don’t temper the eggs in this recipe because I’m not adding them to an already hot liquid. 🙂 As for the exact temperature, I generally find base on the amount of time the filling cooks after bubbles (gentle boil) appear, the custard reaches the correct temperature and, to be honest, I don’t use a thermometer to check this recipe. I’ve never had a problem with it using this technique! <3 I hope you give the recipe a try <3 LMK! Made this recipe without the brandy. My toughest critics said it was the best banana cream pie they’ve ever had. Next time I will add the brandy – none in the house the first time. I look forward to making this pie again – so fun to try new recipes that come out so successful! Thank you. Could you use American or Irish whiskey instead of brandy? I don’t see why not. If you try it, I’d live to hear how you liked it. Of course, the flavor of the whiskey will be different but I think it would be an interesting flavor combo. Thank you for the recipe. It was delicious and easy to follow. My custard turned grainy. What happened? Hi Rose. I’m sorry that happen! When a custard gets “grainy”, generally the culprit is the overheating of the proteins in the eggs. If it ever happens again, a quick way fix the texture and smooth it back out is to give it a buzz with an immersion blender. 🙂 Hope that helps! Hi! When you put the topping on, do you put plastic wrap on top of that or would it be ok to sit in fridge over night with no cover?? Can I make the custard the night before and the whip cream topping the next day? Hi Jamie. Yes you can but your bananas will brown. overnight with no whip cream on it and then just put the whip cream on tomorrow when I will be serving it? Hi Hailey6. Yes absolutely. Place plastic wrap directly on top of the custard so it doesn’t for a skin and you’re good to go! I don’t have brandy…is there something I can use instead? Hey CariAnn so glad you enjoyed! I LOVE this pie. I made it for a dinner last week and it was a hit. I made it today for our thanksgiving dinner, and this time around, I used rum instead of brandy and it is just as good. I couldn’t help but to luck the custard bowl clean! I made this today because most others I’ve tried are just what you said…too lose and messy. Well, the custard is heavenly but it just never did setup so while it tasted great it was still too loose. Sorry to hear that Jenni. I can’t imagine how that happened. This is the firmest recipe I’ve tried and it cuts very clean and easy. I also had the same problem. I let the custard cool for 30 minutes on the counter with wrap over it. But when I tried to put the custard in the crust it was like water. I used heavy cream and whole milk. I simmered it 10 minutes but perhaps I didn’t let it get hot enough? Hi Joelle. I’m so sorry that happened. It’s such a disappointment! I think you are likely right, the custard needs to be cooked to almost a boil reaching a temperature of almost 212 degrees. The egg yolks have a starch-digesting enzyme called alpha-amylase. In order for a successful gelling of a starch in the recipe, it has to be cooked at that temperature. If it’s not, the left-over enzymes in the eggs, digests all of the nice firm starch gel and your custard is nothing but liquid. I put the custard in the cooled crust and then made the whipped cream. Was I suppose to put the plastic wrap on a 2nd time and chill for 3 hours before or after I add the whipped topping? Yes, I chilled the custard in the crust for 3 hours, then add the topping. Seems like a typo for the quantity of vanilla wafers. Overflowing my pie plate. I believe it should be 1 1/2 cups of wafers. I will continue on with the recipe hoping the rest is accurate. Hi Deb. NO, it’s not a typo. I used 2 1/2 cups coarsely crushed Vanilla Wafers. I wanted a nice thick crust. I didn’t have any extra crumbs and it fit very nicely into my pie plate. I’m wondering if the pie plates we’re using have different depths. 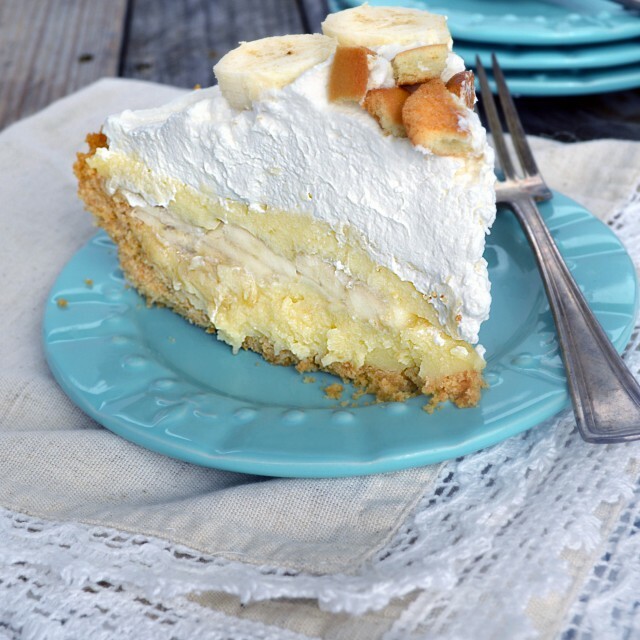 As a child my favorite pie was banana cream pie, it seemed I couldn’t get enough of it. I haven’t had it in years but this looks so good, especially with a vanilla wafer crust – who could resist? I think it’s time to make another pie! WOW! That is one gorgeous pie. Banana pie is one of my hubby’s favorites. He has been having some health problems…I think he deserves this pie. Pinned. Making ASAP! Thanks for a great recipe. Thank you Mary! I hope you enjoy it!